Posted November 28th, 2018 by Crisis Centre & filed under News. 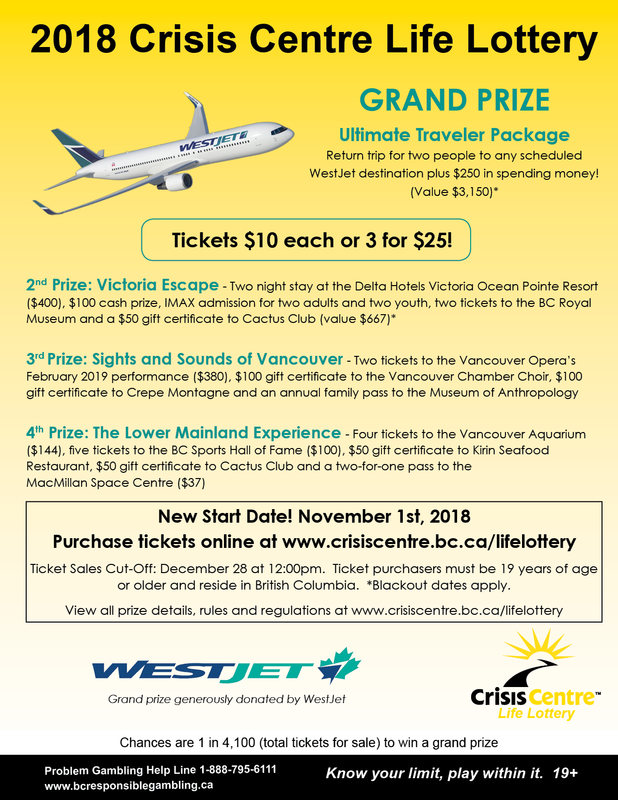 Tickets for the 2018 Crisis Centre Life Lottery have closed, winning tickets have been drawn, and winners have been notified. Congratulations to all the winners, and thank you to all our ticket buyers for your support. Stay tuned for the 2019 Crisis Centre Life Lottery, launching late fall 2019. Draw Information: December 31, 2018, 12:00pm, 763 East Broadway, Vancouver, BC. Winner names will be posted by 4pm on December 31, 2018. Licensee Information: Crisis Centre of BC, 763 East Broadway, Vancouver, BC. 604-872-1811.